PMSBuddy Helps (Men) Track That "Time Of The Month"
For men looking to have some sort of forewarning of their girlfriend or partner’s “time of the month,” PMSBuddy has got you covered. 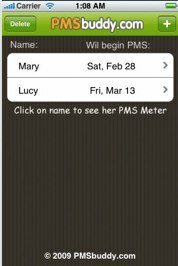 PMSbuddy’s iPhone app allows users to track the menstrual cycles of the women in their lives in the hope of notifying men and helping them cope with the dreaded PMS (premenstrual syndrome) and its effects. As ridiculous as it sounds to a woman, the service is currently being used by over 100,000 people worldwide, via an iPhone app, a website and Facebook widget. PMSBuddy is launching a new version of its iPhone app that will offer push notifications of upcoming PMS and the the ability to locate flower shops near you (via GPS). PMSBuddy will also be rolling out similar applications for Android and Blackberry phones. And PMSBuddy is expanding to other verticals. The startup will soon be launching Fertility Buddy, which allows women to track when they are ovulating to increase (or decrease) the likelihood of conception. Similar apps to PMSBuddy include MyMate and iAmAMan.